It’s Christmas Eve 1843 and Jacob Marley visits Ebeneezer Scrooge. There’s only one problem. Marley is dead. Join Scrooge on his magical journey of self realisation and redemption. 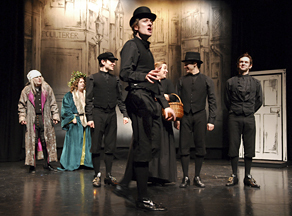 Faithful to Dickens’ text, the world of Tiny Tim, the Ghosts and all Dickens’ other marvellous characters is brought to life with songs and life size puppets. Dickens’ story helped define the image of a Victorian Christmas. Let this new adaptation make Christmas special for you.